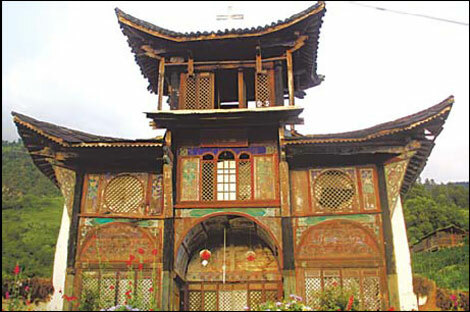 A Catholic church, with its flying eaves and carvings, on the Yunnan-Tibet border, is an example of the interplay of influences in this region. At last author Fan Wen has his reward for a decade of immersion in the multicultural wonderland along the Yunnan-Tibet border: Canticle to the Land (Dadi Yage), the closing novel in his longish trilogy, has just been published in Chinese. Why locate the tale there? 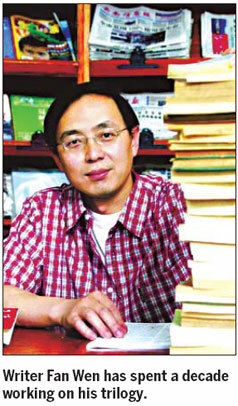 "It's my own 'creative paradise', an inspiration of sorts," explains Fan, a devout Catholic from Sichuan province. "You can interpret this as a summons from God, or as a writer who has been vanquished by a certain spirituality, the cultures and beliefs of the people of this realm." That day in 1999 when he came across the "lonely" grave of a martyred Swiss missionary in Lancangjiang Canyon, Father Maurice Tornay, he realized he had found his "sacred vocation". Indeed, the area straddling the provinces of Yunnan and Sichuan and Tibet autonomous region is an anthropologist's dream. One finds Tibetans, Han, Naxi, Yi, Lisu and other ethnic groups living together. "I find describing the interaction - and collisions - between different cultures a challenging and engaging affair," Fan says. "Conflicts have taken place due to differences in culture and faith, like wars between Naxi and Tibetans, and Tibetans and Han. Irreconcilable contradictions occurred between Tibetan Buddhism and Catholicism when the latter was introduced." Local annals chronicle religious disputes, and documents in the hands of missionary societies record tales of evangelists who died proselytizing. "As an author, I see story lines and the fates of characters in all this People of different cultural backgrounds and levels of civilization inevitably come into close proximity, and in the course of this, some pay for it with their lives, while others discover a new shore on the other side. But their sacrifices leave us with a priceless heritage." The trilogy spans most of the 20th century, hopping back and forth between the decades and capturing the non-linear Tibetan sense of time. Fan's imagination almost seems to get the better of him as Living Buddhas levitate and Shamans summon spirits to do battle, but the stories are firmly rooted in the locale's colorful history. Historical fiction with dabs of highly entertaining "supernatural realism" thrown in, if you like. The opening novel, Harmonious Land, (Shuiru Dadi, 2004) recounts the tale of a multi-ethnic settlement in Lancangjiang Canyon (gateway to Tibet), beset by battles between arrogant French Catholic missionaries, incompetent officials and their marauding troops, Naxi Dongba Shamanists, and the dominant Tibetans, not all of whom lead pacific, vegetarian lives in the local lamasery. Overseas interest in the 48-year-old author's first volume has been strong, and a leading French publisher, Philippe Picquier, bought the French-language rights and commissioned Stephane Leveque to translate it.